Galley Wench Tales: Poison Apples – Beware the Machineel! 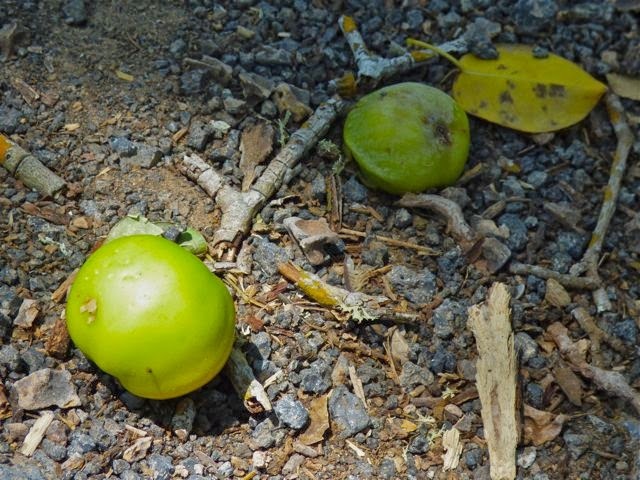 Deadly machineel apples – unless you’re a Galapagos tortoise. The refreshing, delicious scent of crisp, green apples wafted by as we appreciated the cool canopy shade of a Machineel grove on a hot Galapagos afternoon. 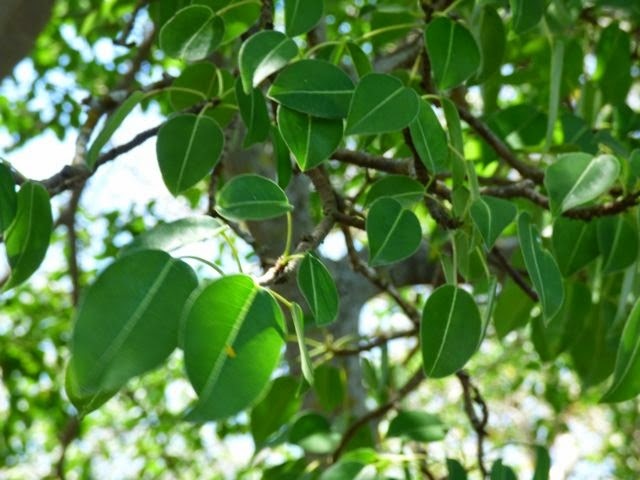 Machineels are handsome trees, with sculptural, twisting branches and glossy, almost waxy emerald green leaves. Pippin-green Machineel “apples” are about an inch or two in diameter; abut the size of a crab apple. Machineel leaves… aren’t they beautiful? But, beware! They’re deadly. Those cute little apples are poisonous. Unlike Eve, we will not give way to this apple’s temptation! What’s more, in the Caribbean, where we first encountered Machineels, we were warned the tree itself is so poisonous, not only do you want to take care not to brush up against them, you’d best not take shelter under them in a rainstorm. The rain can carry the trees toxins down, potentially causing rashes. 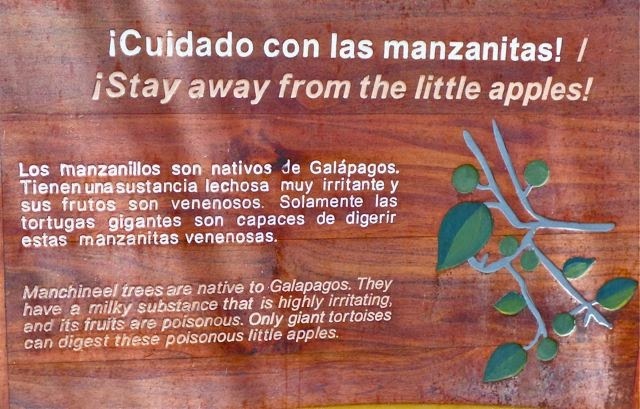 Whether Manzanitas (Spanish) or Machineel (English) … beware! Imagine my surprise in discovering Galapagos tortoise love them; they’re a mainstay in their diet! They must be in hog, or rather, tortoise heaven here. Machineels abound. 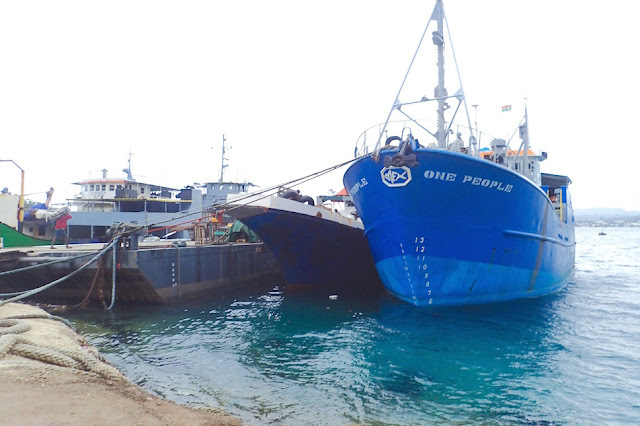 This blog post was written when we anchored in Galapagos Ilsa Isabela’s Puerto Villamil (S0.57.924 W90.57.750) an incredibly exotic mix of diverse land and sea life. 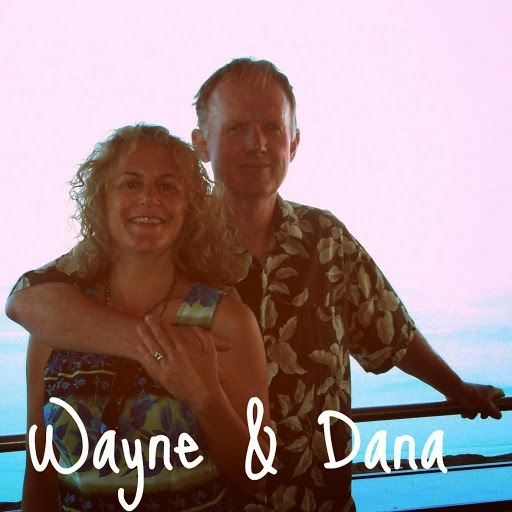 It was prescheduled to run while we're sailing for the Marquesas – French Polynesia. It’s a 3,000+ mile stretch of open ocean, no stops in between. We expect it to take us a little less than a month. Thanks to our Iridium Go satellite (limited) WiFi hotspot and the help of Trisha Dunn, there will be brief periodic posts along the way of our passage. As well, this is one of several prescheduled posts to run during passage. There will also be some catch-up posts from our whirlwind Galapagos adventures. 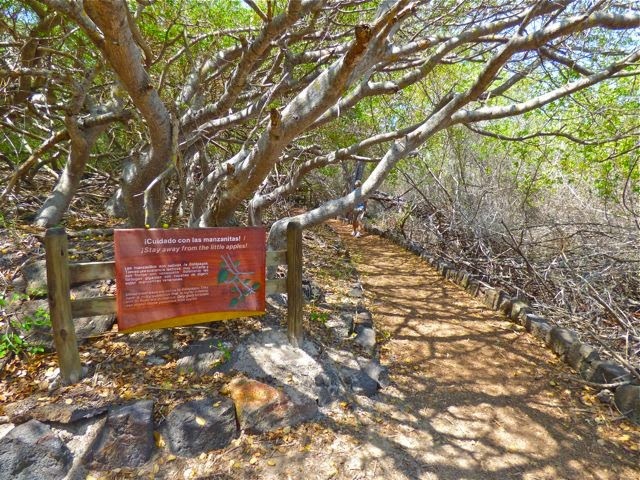 I remember visiting Manchineel Bay on Cooper Island, BVI. Trees near the bay were all cleared of Manchineels - but up the hill there were some. On another trip the boys and I went on a hike and weren't aware of Manchineels. We just merrily walked along under trees and through brush. I remember it well because I was in flip-flops and got a cactus needle in my heel. Anyway... those Manchineels are definitely something to stay away from!